Cage, aquarium or bin?… Stop searching around, below you are going to see the Best dwarf hamster cages, tanks and our Top 10 with the places to buy them with up to 60% discount. Let’s face it, your pet needs a proper home. 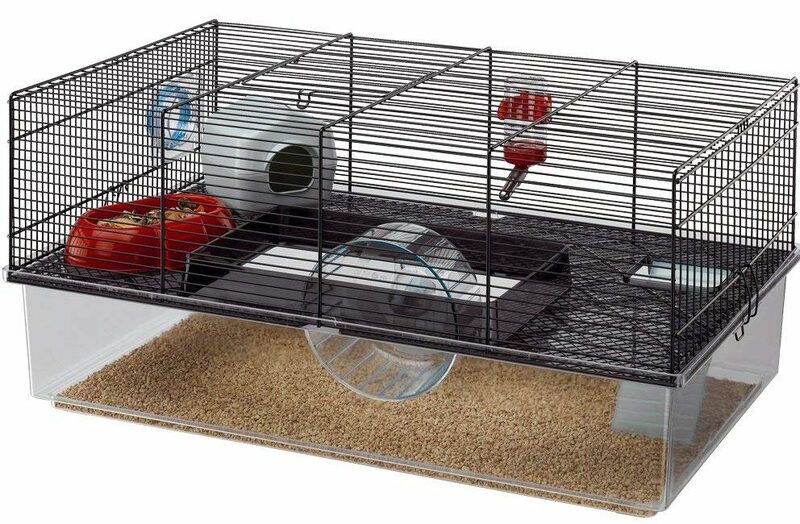 But what defines “proper living quarters” and which is better… Cage or an aquarium for dwarf hamsters? 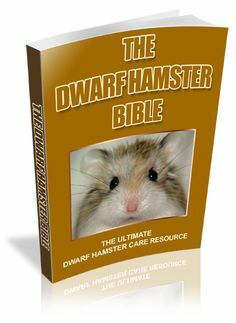 Stick through to the end and RussianDwarfHamster.Org will also show you why we adopted over buying a dwarf hamster at the pet store and our TOP 10 dwarf hamster accessories to go with your new home. What is better, Cage or Aquarium? This is completely up to you, your available space and your budget. Dwarf hamster Aquariums – Aquariums generally are an more expensive upfront cost, but usually will save you more money long term as they are versatile, safe and spacious. For example, it can be used for many other projects like fish tanks, amphibians or storage. The visibility is perfect for children, adults, and guests too. Watching your fascinating hamsters playing and exploring is the best part! We say “Aquariums” – But they are more designed for hamsters. Just look similar! Dwarf hamster Aquariums also look modern, keep the house cleaner and are generally easier to clean. 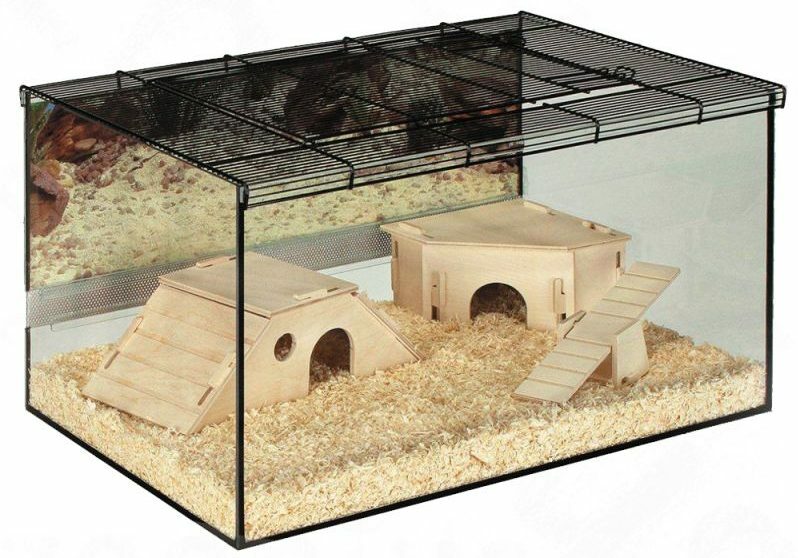 A 5-star example of this would be the ECO Hamster Cage Habitat from Zooplus 5% offer here. Large Dwarf Hamster Cages – These are normally your go-to option when purchasing a hamster, but the pet stores sell cheap and small-sized cages for dwarfs which are usually not big enough to keep a full-grown Russian, Roborovski, Siberian, Chinese or winter white dwarf hamster. Usually 25-40% cheaper than aquariums/hamster tanks and come with accessories included (Food bowls, water bottles, hamster houses, and a wheel. Friendlier for children and colorful cages are exciting for youngsters. Large dwarf hamster cages make great Instagram/Pinterest photos. Small cages are not suitable for long-term homes because they get dirty quickly, do not provide enough space for a healthy lifestyle and hamsters become bored quickly and start chewing the bars trying to escape… Which is annoyingly loud and will keep you awake all night! A XL large dwarf hamster cage or large hamster tank will be your best options for keeping your new hamster happy and healthy, and will make your hammie easier to tame! The necessities needed inside your dwarf hamster’s environment are fully laid out here. An exercise ball, reframe from using this more than 15 minutes a time. The bigger the floor space, the better. A basic recommended rule is 1 square ft per dwarf hamster. Do not ignore this! TOP 10 Best Dwarf Hamster Cages and Aquariums – Big, Large and Cheap! Number 10 – Ferplast Laura cage – This exciting habitat is a great home for observing, handling and playing with your pet. It comes with 2 floors and just enough space, this is one of the smaller cages, however. Cheapest place to buy in the UK here, and the rest of the world here. The Ferplast Duna is fairly easy to clean, everything is removable making it ideal for children and young adults looking to be creative with their hammie. Number 9 – Ferplast Kios – Yep.. Another Ferplast! They do make great cages, they are sturdy and are known to not fall apart even after years of use, unlike other ones on the market. 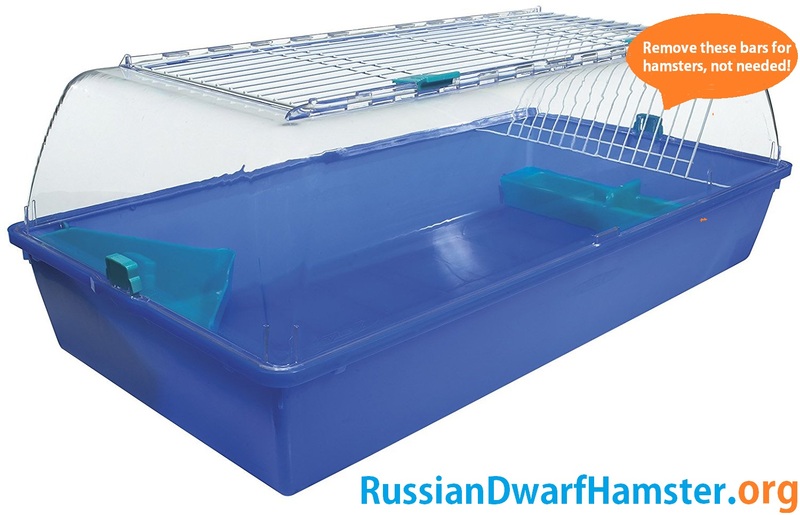 This cheap dwarf hamster cage has a cage space of 70cm x 47cm meaning its a good size and will give your hamster some space to make every day different whilst also being cozy. High base surrounding helps keep all the bedding from escaping and can hold large amounts of bedding which hamsters enjoy, promoting natural foraging. Easy to connect with other cages like the Ferplast Laura cage or other Ferplast products, great when more than one dwarf are living together and families that have multiple dwarfs. Easily one of the best value for money habitats available! 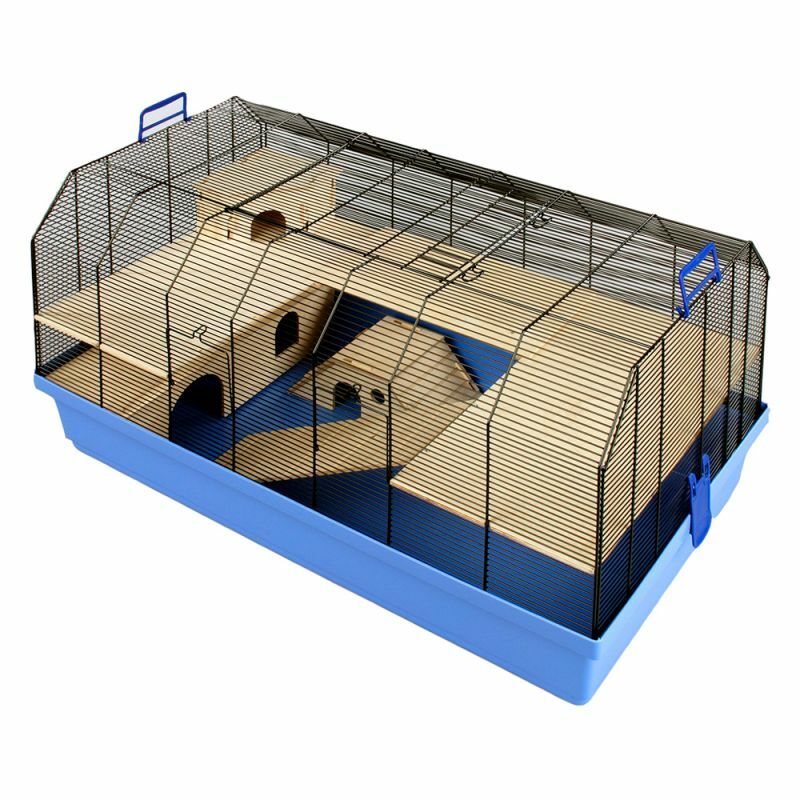 This big dwarf hamster cage is mainly available around the world but not in the UK. It comes with a whopping 91cm x 48cm which is a good size for not under $70. Our first aquarium for dwarf hamsters on the list! This spacious aquarium is one of the cheaper aquariums available online that looks visually fantastic in any home. It does not come with any necessities, however, do be sure to see our Top 10 Hamster Accessories first! This Aquarium does not come with a lid also, make sure to keep animals like cats away from the opening or simply put a mesh over the top. Easy to clean, will keep your house tidier whilst giving your hamster a great view. 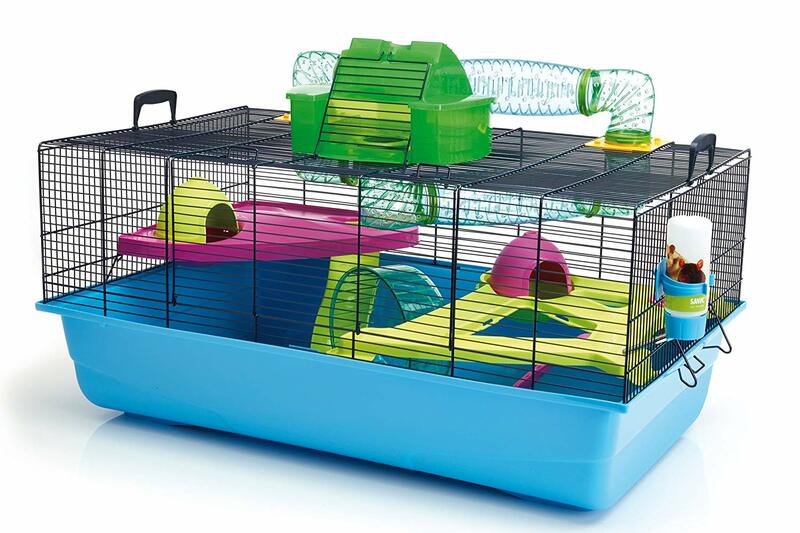 This fun hamster habitat is by far the most customizable and is an exciting cage for children AND very spacious. It comes with everything you see in the picture and all the necessities too. It’s a perfect first cage. The wheel in this cage is fairly quiet and fast similar to a silent spinner. Does not need many extra accessories, but more is always fun! Why we recommend this cage – It saves a large amount of money upfront. If you were to purchase all of the accessories included with Savic Hamster Heaven Metro it would cost you over $50 extra! It’s really interesting what some people do with theirs. Photo/video reviews here. Zooplus have created a cheap Terrarium for dwarf hamsters that look smart and clean, comes with a bunch of wooden accessories that are good for hamster teeth also. For under £65, (which is really cheap for a glass tank) it includes everything in the above picture except bedding, a water bottle, and a food bowl. These can easily be picked up, however. The awesome part about the Zooplus Terrarium is that you will never have to worry about your hammie escaping or any mess outside the tank. It also provides good sound insulation at night. You can get this on at Zooplus for cheaper than anywhere else online with free delivery here to most countries. Ferplast has some excellent cages, this one encourages hamsters to be hamsters. In the wild, dwarf hamsters generally, awaken at night and begin burrowing new tunnels and foraging for food. They love making big nests and feel safer underground. The Hamster Cage Black’s bottom floor is very spacious and provides an excellent area to fill with bedding, accessories, and food. Then just watching your pet create a fantastic natural home. This fun dwarf hamster cage is also customizable for the owner giving you the choice of making it a burrow and digging area or… whatever you want! Like the Terrarium, the top and bottom floor has crystal clear visibility and can easily be changed around weekly. This cage is available all over the world with fast delivery here. What a joy to watch! The Alexander part wooden, part plastic cage makes a hamster lifestyle a fun castle. The wood included with Alexander Small Pet Cage is safe for all types of hamsters and will help keep teeth healthy. Did you know that a hamster’s teeth never stop growing? 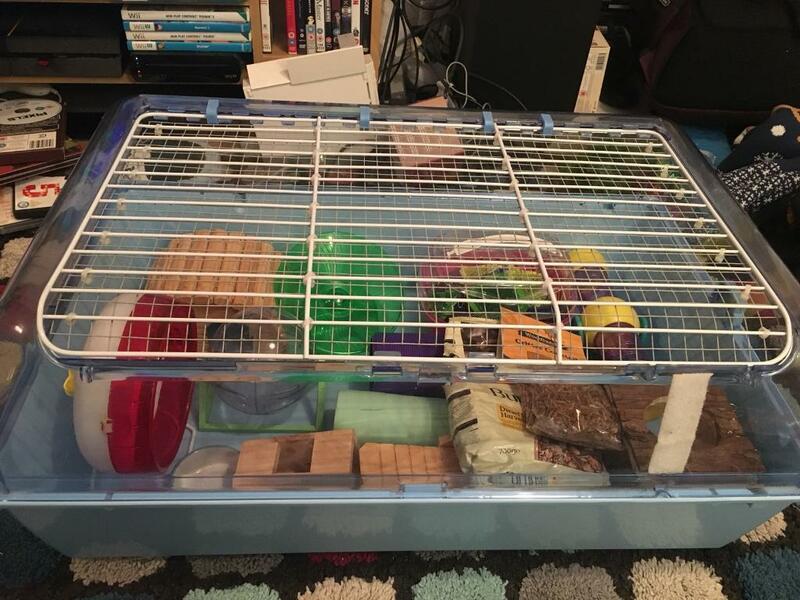 For under £75, you really cannot get a larger cage that includes 6 wooden accessories, very safe and reassuring for owners and looks smart with lots of bedding. Wheel – You will need to add a running wheel as it does not include one. This will be perfect. Water bottle – Add a water bottle to the cage, just make sure it’s not above a wooden section, as wood may be harder to clean when damp. Damaged parts – Regularly check wooden parts for worn damage that may harm your hamster. Replace when needed. Again, like the Zooplus Terrarium, it’s cheaper to purchase from their website directly and includes free shipping here. Choosing between the top 2 was really hard, however, the Zoozone Habitat is the cheapest spacious cage money can buy. This really is cheap and available for shipping all over the world! The Zoozone 2 habitat is the quiet, as tidy as a Terrarium/aquarium whilst having almost double the space for price compared to its rivals. The best advantage that the bars are on top and not accessible to hamsters unless they can climb on something tall. This stops “chewing on the bars” read more here about it. Hamsters are nocturnal, so it’s common for them to by up all night using all their energy running, climbing and playing. This cage is tall, if hamsters cannot reach the top bars, they cannot gnaw, waking you up at night. 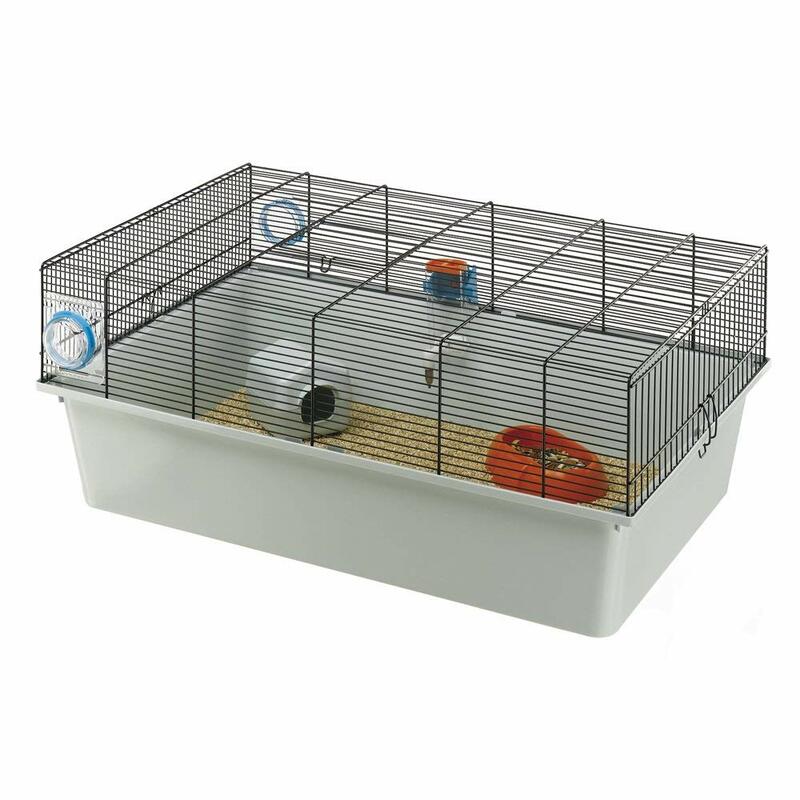 72cm x 46cm meaning it’s not the biggest dwarf hamster cage, but its much cheaper whilst just inside the recommended standards! 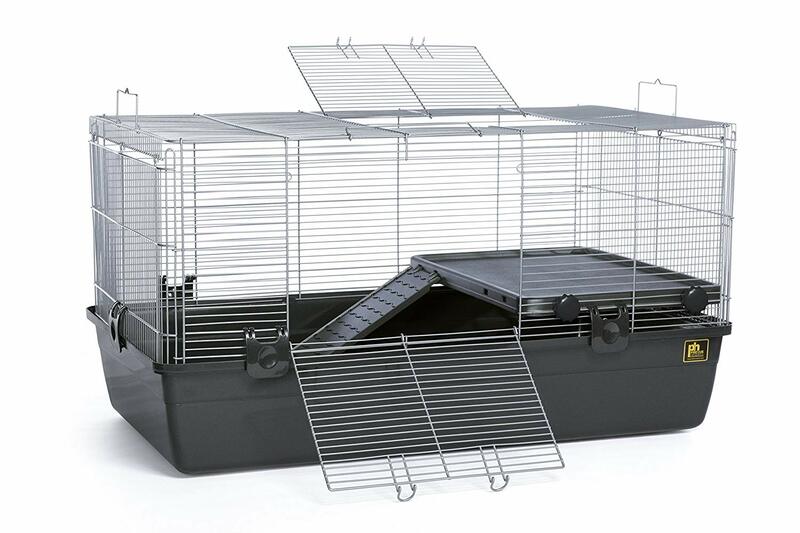 The Hagen Zoozone Indoor cage is very popular with all types of small animals. Does not come with a water bottle, many order this with it. The top bars are spaced for small guinea pigs, it’s not advisable to put tall objects in the middle that give hamsters an opportunity to climb to the top white bars. Smaller hamsters are excellent escape artists and will try and escape. Here is an image of the top, with mesh added, you can see how that it’s a good idea to prevent any unwanted burglars. We recommend adding your own mesh to the top bars just for extra security like this. See more picture reviews from recently bought customers here. Just wow… This cage is beautifully simple, stylish and safe. Just looking at the homes that customers have made are inspiring! The Living World Eco Habitat. No bars, no escaping and no bar chewing at night waking everyone up! NO mess outside around the tank, glass saves time cleaning escaped bedding and easy to wipe down/clean. So much space makes customizing creative. These tanks always impress guests and are cheaper than XL aquariums of the same size. Even the small version of this tank is a good size for a Roborovski dwarf hamster or other baby dwarf hamsters. Check availability on the Eco Habitat here. A fantastic cage that will have perfect visibility, easy to clean and will keep the house tidier! What more could you ask for? 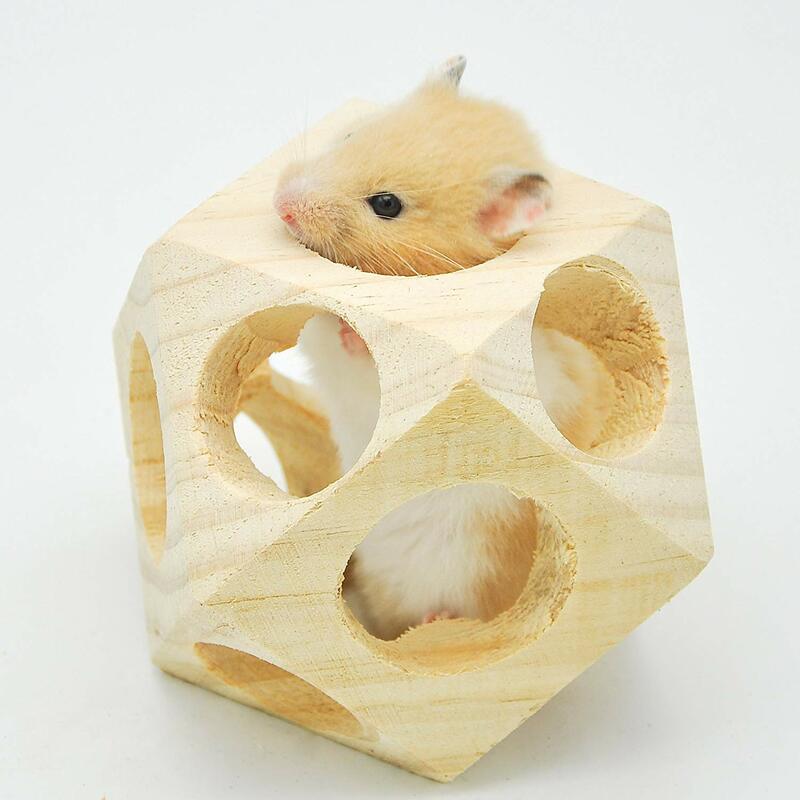 You will need to buy extra accessories, so why not check out our TOP 10 Dwarf Hamster Accessories here. New orders at Zooplus get 5% off here. Haven’t got a dwarf hamster yet? See our adopted one and why you should adopt too! If you have any suggestions for our next top 10 Best Dwarf Hamster Cages 2020, let us know below.